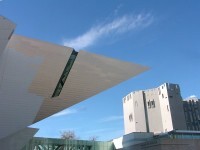 Housing one of the largest Native American art collections in the country, the Denver Art Museum is a huge, seven-storey structure that also features the works of American Western artists, and art from Africa, Europe, Asia and the Pacific. The growing Native American collection displays work from about 150 tribes throughout the country, arranged geographically and spanning almost 2,000 years. Discovery Libraries contain shelves of art objects and prints, a costume closet that allows visitors to try on olden-day clothing, as well as reading corners. The museum is interesting for people of all ages and is open every day except Mondays. Opening times: Monday to Thursday 10am-5pm; Friday 10am-8pm; Saturday to Sunday 10am-5pm.